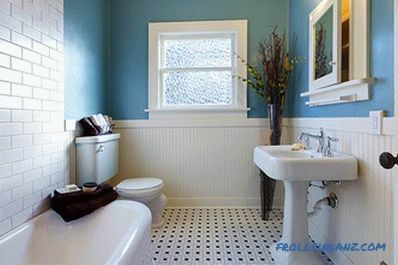 A small room for a bathroom is a feature of the buildings of the last century. Many apartment owners resort to redevelopment in order to increase the area. What can be done? 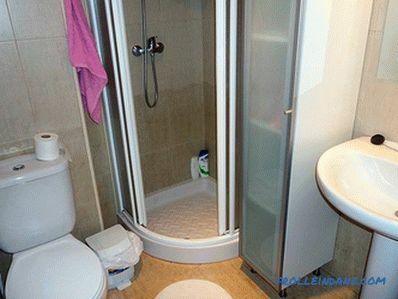 For example, to combine the toilet and bathroom - this will free up a little space. 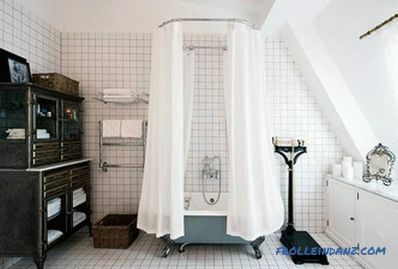 Anyway, if you think about the interior of a small room, it will be very comfortable and visually increase. 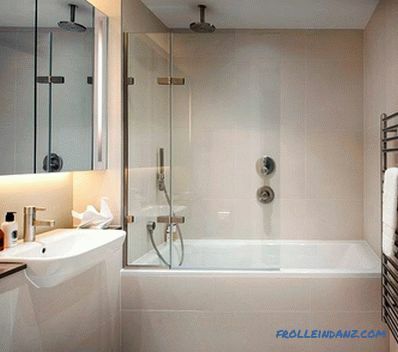 From this article you will learn how to make a choice between a bath and a shower. 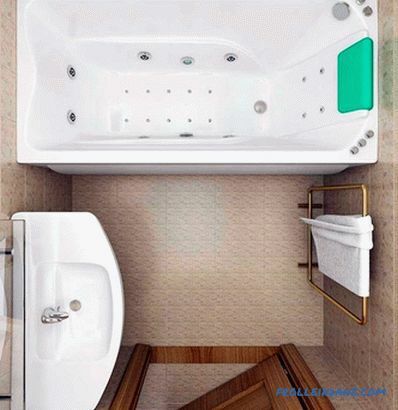 You will be able to understand the advantages and disadvantages of a combined bath and what is worth considering when making the final choice. 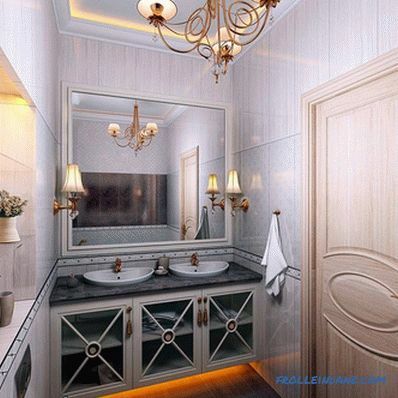 In addition, information will be provided on how to visually expand the space with the help of light, mirrors, niches and doors. A lot of photos will help you to understand what exactly suits you. The article also discusses the styles that are used for the design of such premises, photo illustrations are attached to the descriptions. In the process of drawing up a plan, you need to determine key moments. What does this include? 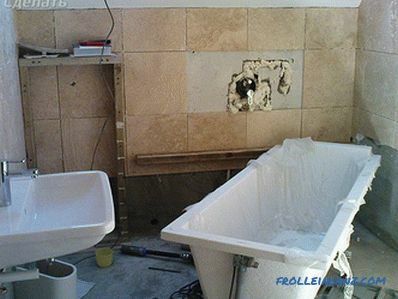 Worth to decide: will be installed bath or shower? 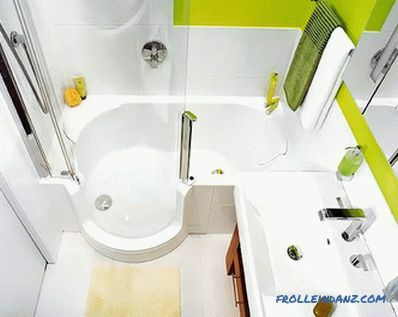 The design of rooms of small size requires careful planning, as in this case, every centimeter of space on the account. 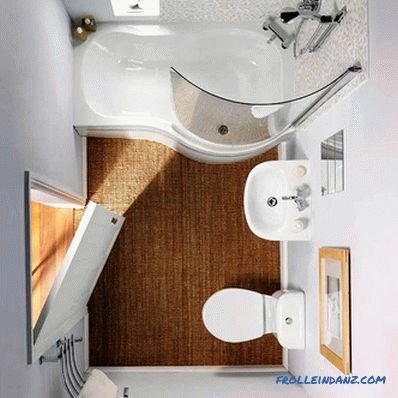 And also it should be considered whether there is a toilet in the same room. 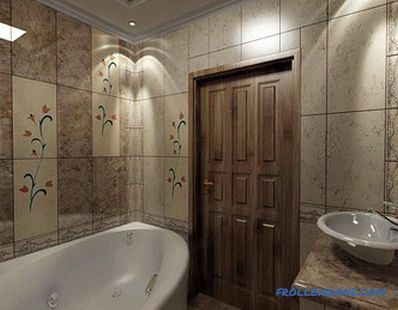 The final result of the repair depends largely on the choice of material for wall decoration. 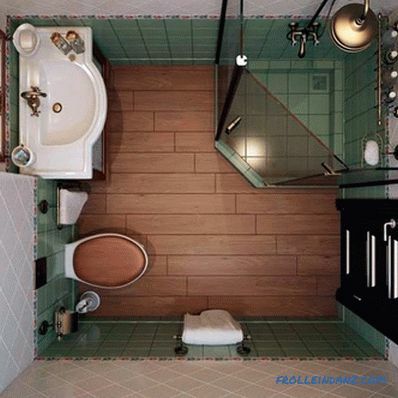 If you look at the question from a practical point of view, then, of course, it is better to make a separate bathroom and a separate toilet. 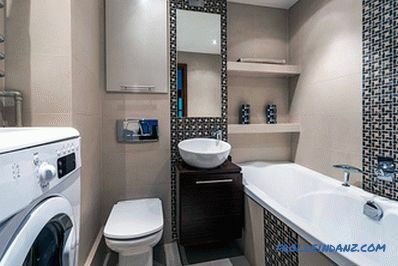 If you have a large family, then there will not be a queue of those who want to wash at the same time and use the toilet. 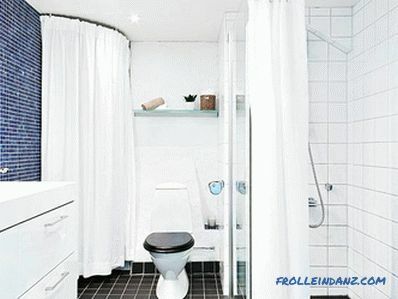 In addition, there will be no unpleasant odors in the bathroom without a toilet. 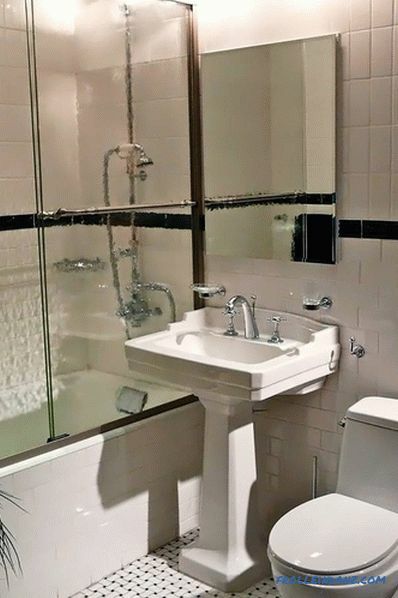 But on the other hand, by combining these two rooms, for example, in the Khrushchev, you can win the missing space, which will allow you to more correctly position the plumbing and furniture in the room. 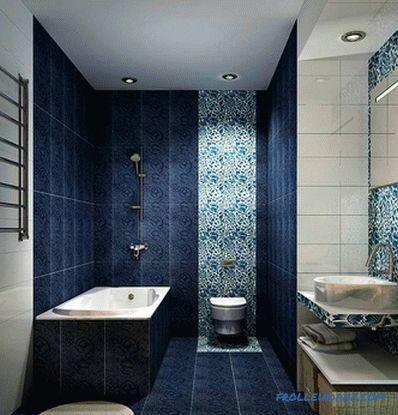 Competently decorated interior will create a cozy atmosphere in the combined bathroom. 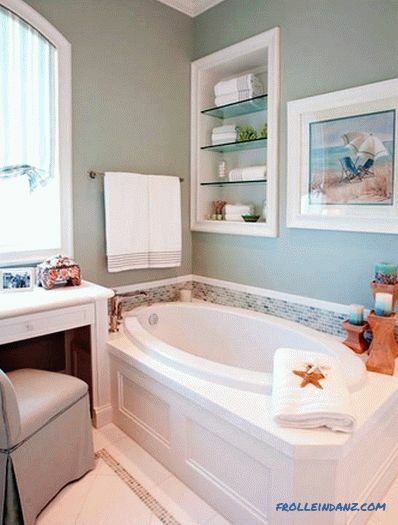 The next most important issue is the choice between a bath and a shower. And here again it is worth considering a few important points. Much depends on who will use this room: young people, children, the elderly. 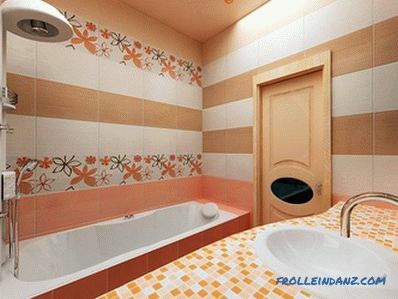 For bathing children shower is hardly suitable. 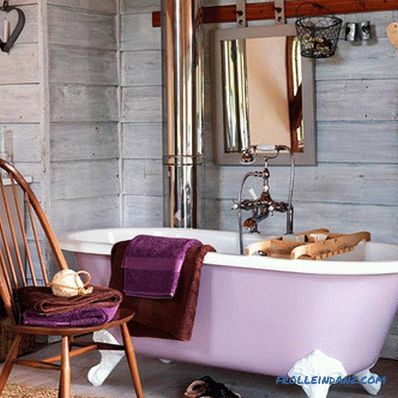 Older and fat people, more often, would prefer a bath rather than a shower. 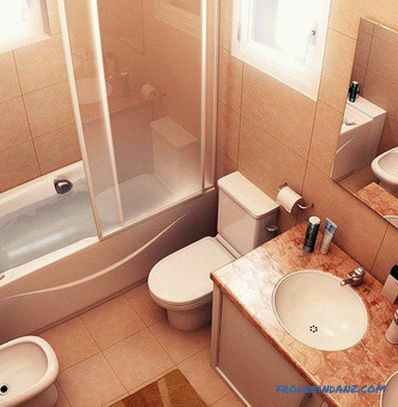 Much rests on the preferences: someone likes to quickly take a shower, while others prefer to soak in hot water. 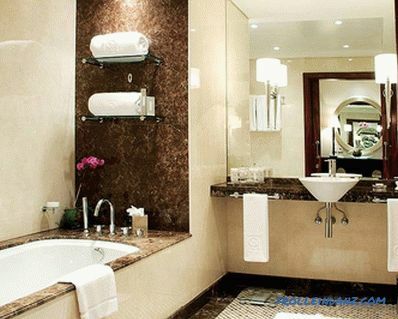 You can enjoy water treatments in it, which has a beneficial effect on the nervous system. 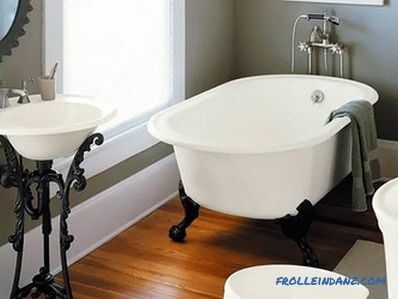 It is convenient to bathe babies. 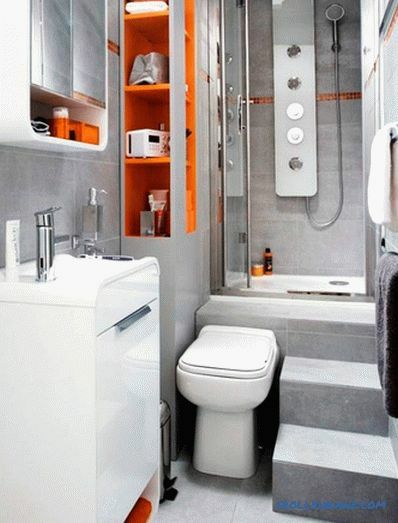 Save space in a small room. 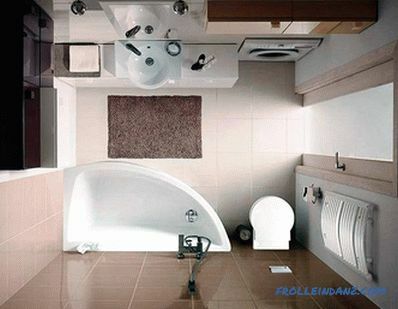 Ability to significantly save water. 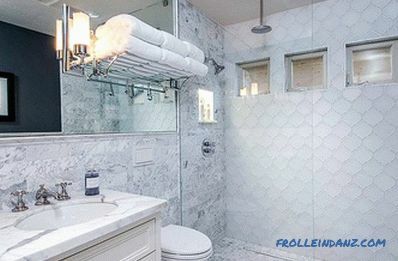 The cost of a shower stall is higher than a bath. 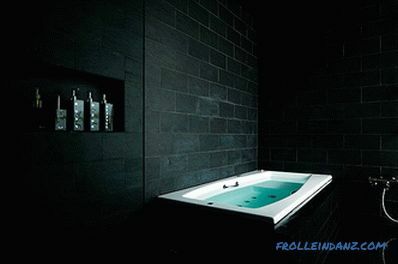 Relax and lie down in the shower will not work. 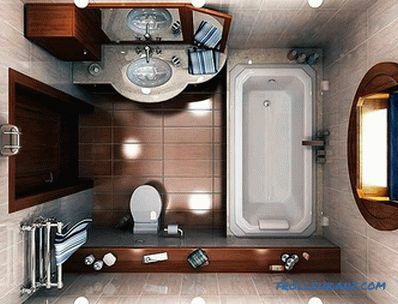 It is more difficult to care for the cabin, as it will take more effort to do the cleaning. 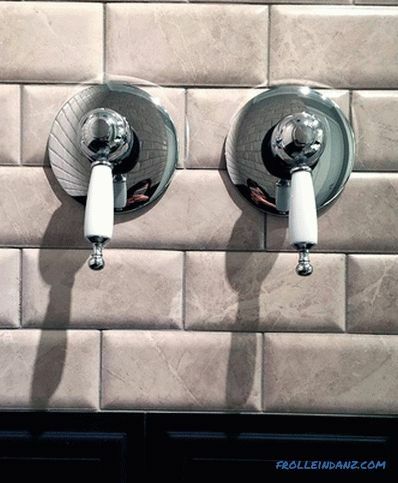 It is worth noting that the showers are different - closed and open type. 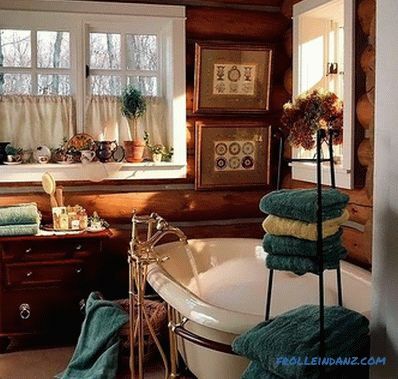 Therefore, the price depends largely on the number of lotions in the shower. 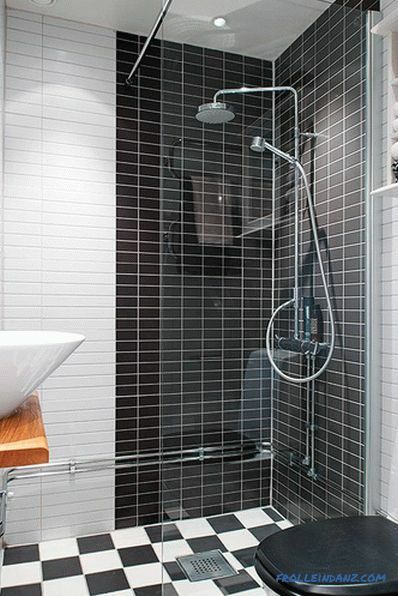 And also, as an option, you can independently build a shower tray, which will save space and money. Use of agglomerate as a finishing material. 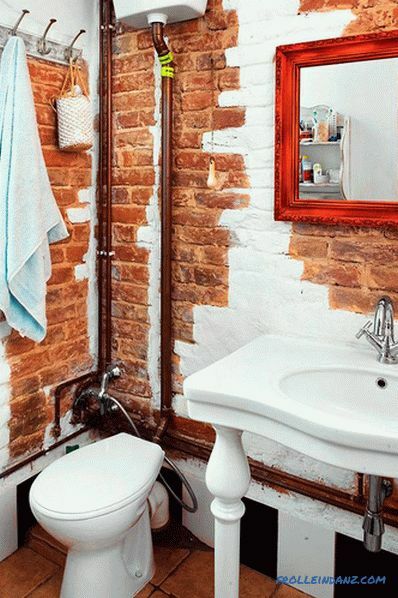 Painting the walls in the bathroom is, of course, the most short-lived finishing option, as well as wallpapering. Although with a limited budget it may even be. 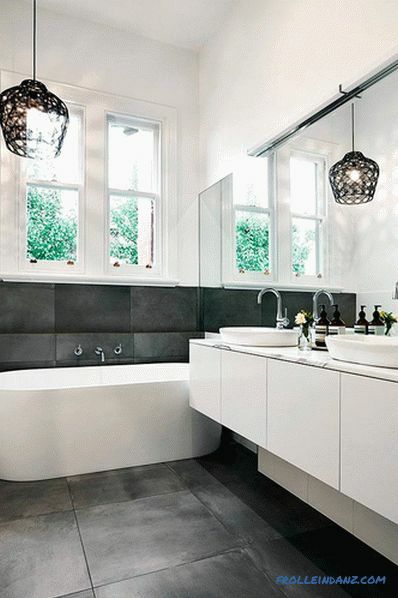 Innovative materials such as cork, porcelain stoneware and agglomerate are most often used in modern style. Cork is resistant to mold, fungi and household chemicals. This material also has a low thermal conductivity and has a relatively small weight. Walls, corked, warm and smooth, do not dampen. Of the shortcomings of the material worth noting its high cost. In addition, it has low mechanical strength. 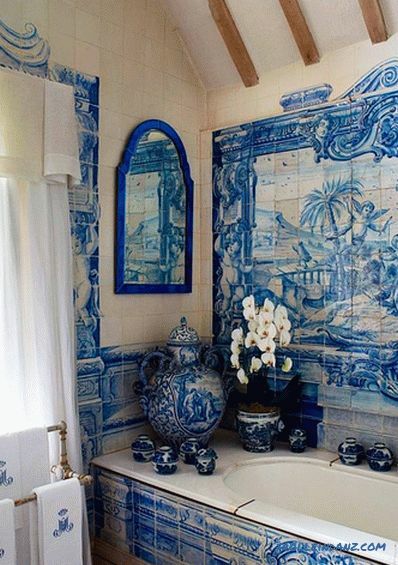 In past centuries, this material has been extremely rarely used in bathrooms. 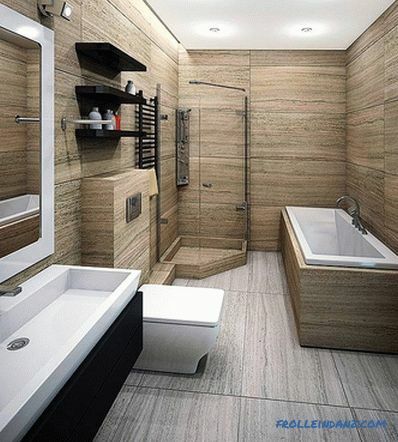 It was believed that water and wood are incompatible concepts. 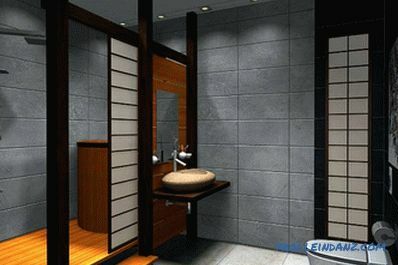 However, modern methods of wood processing allow it to finish wet rooms. 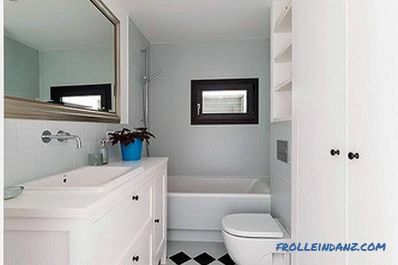 And nevertheless, in order for the wooden walls and the floor to last as long as possible, it is necessary to make correct calculations and proper installation of ventilation. 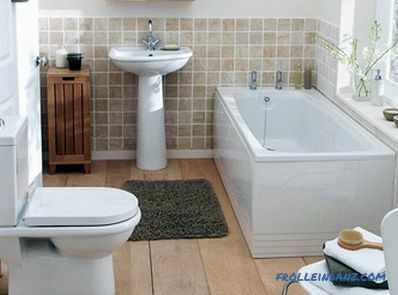 The only minus of wood is that when installed, the useful area is reduced. 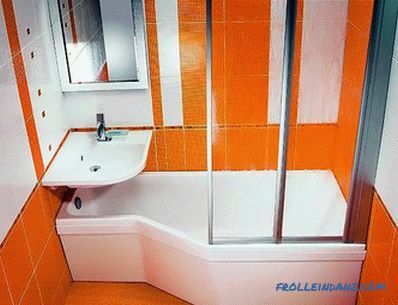 This material appeared on the construction market relatively recently. 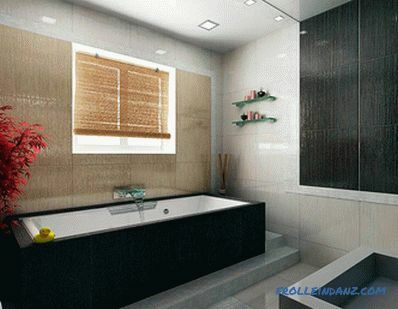 Agglomerate is an artificial stone close to natural. In its production, natural mineral rocks are interconnected with a cementing agent. 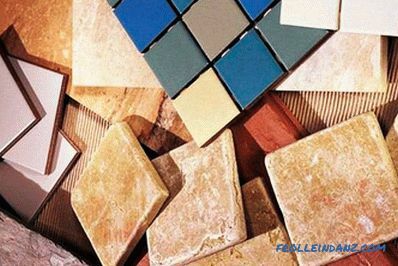 Agglomerate is, in fact, a tile of stone, having a rich color palette, comes in different sizes. 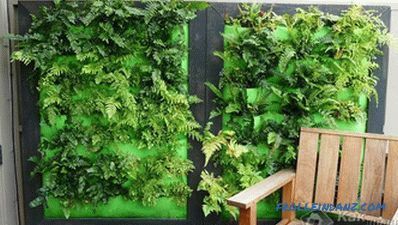 The material has a high moisture resistance. It is easy to work with the agglomerate, since it fits in the same way as ceramic tile. 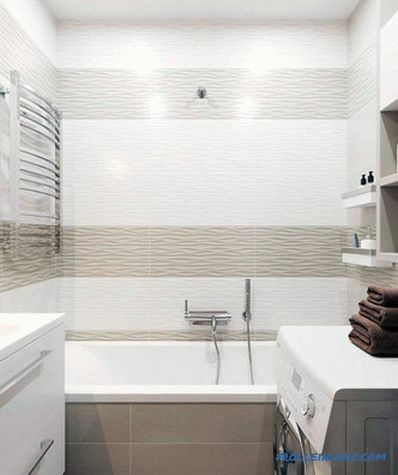 The main difference from the tile - the possibility of using seamless masonry. 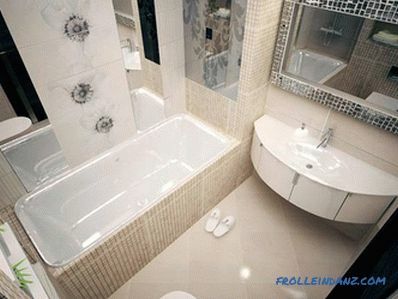 Porcelain stoneware is an artificial analogue of natural granite. 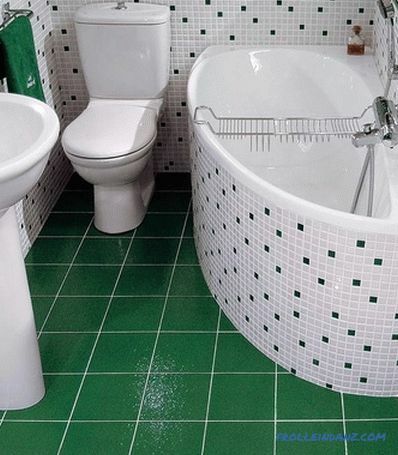 It has the lowest water absorption rate, therefore it is considered the most suitable for finishing walls and floors in a room with a high level of humidity. 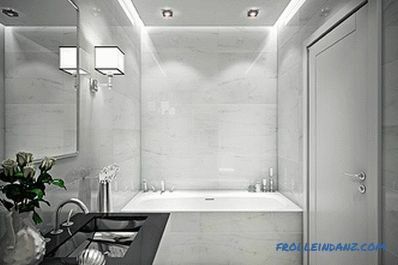 Matte porcelain stoneware has a high degree of wear resistance, but its polished counterpart is more capricious, as it is more susceptible to dirt and scratches. The lack of porcelain stoneware is heavy. 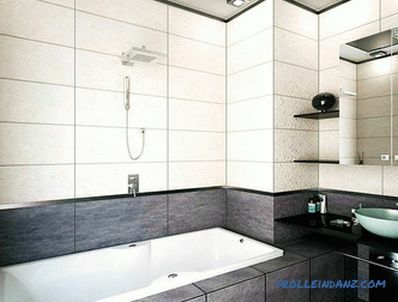 If you have thin walls in the bathroom, then this material should not be used for its finishing. 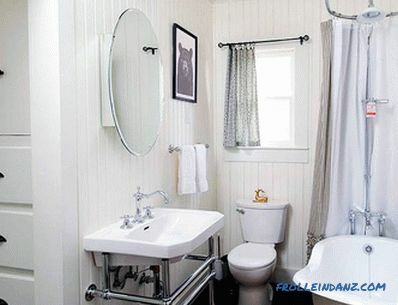 the small bathroom didn’t look visually even smaller and had a beautiful appearance; it should intelligently hide communications. Risers can be sewn into a compact box, providing access to water metering units. 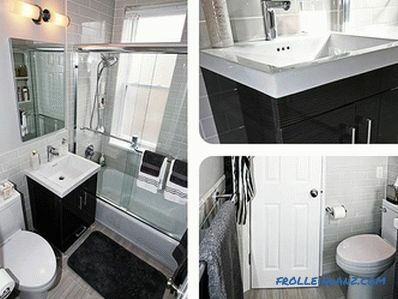 Pipes can be hidden in the grooves or, as a last resort, in a box-step. 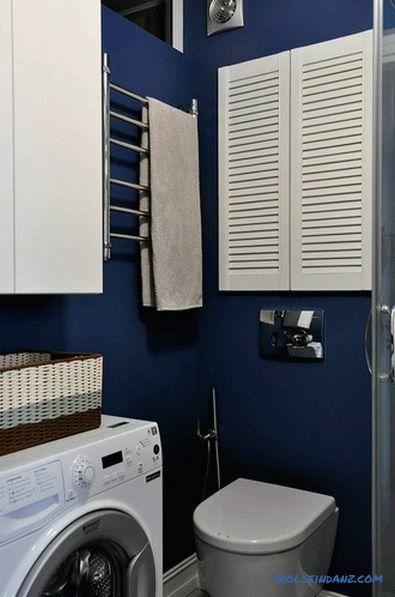 If you are unable to install a heated towel rail, then as an alternative, you can install an electrical one by installing an outlet near it. 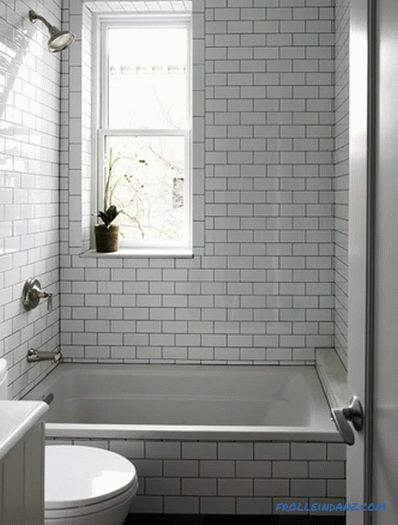 If you have the opportunity, then install a bathroom with a hidden installation, which will also allow you to save space. 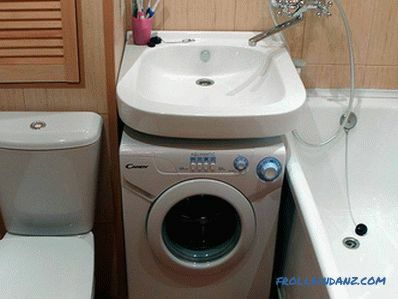 As for the washing machine, it can be installed under the sink. 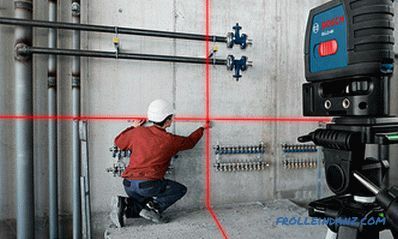 This is possible provided that you have a machine with a horizontal load. 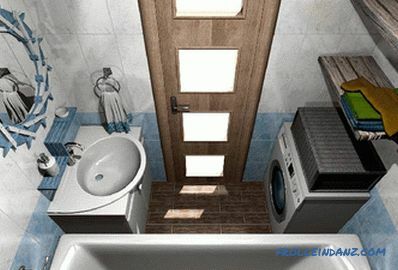 Such a solution will significantly save space. The effect of color on perception. 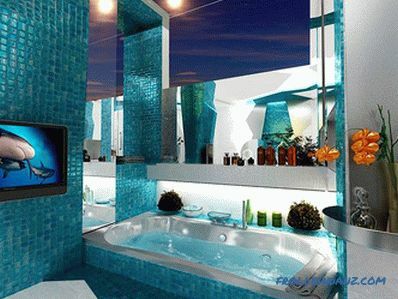 Mirrors as a material for the visual expansion of space. 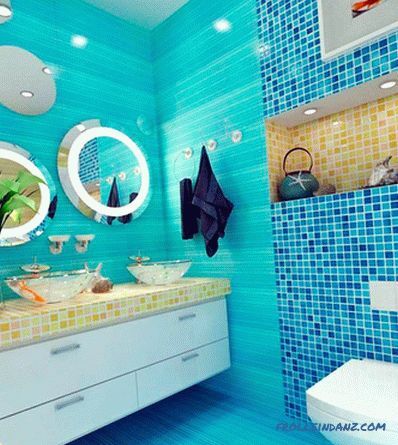 It is already experienced that time when it was believed that the design of the bathroom must be used in blue and turquoise. 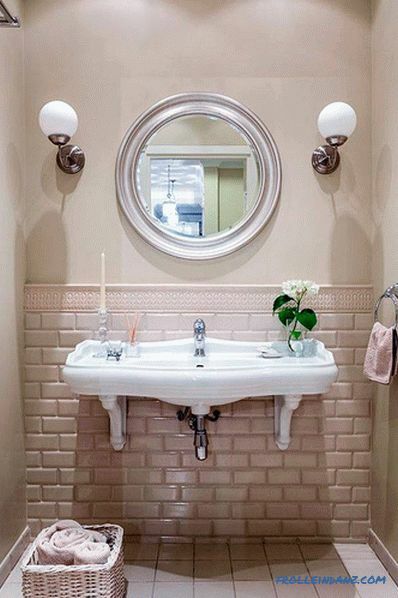 In reality, ivory and white pearls, warm beige shades and pale pink palette are best suited for a visual increase in the room. 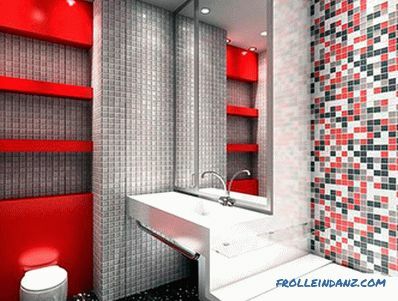 With such a color design should take care of the presence of bright color accents. 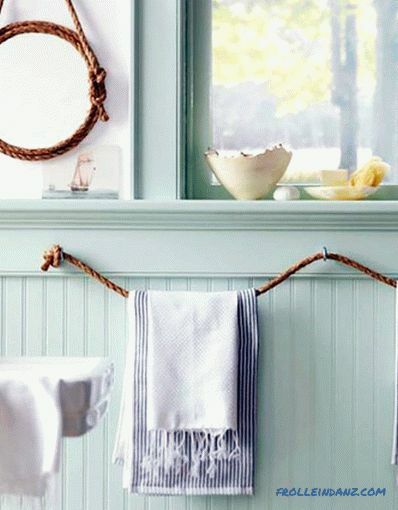 You can use bright brushes, sponges and towels. 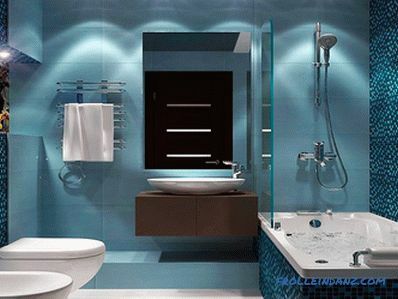 If you decide to decorate the bathroom in dark colors, then you should correctly choose the lighting. 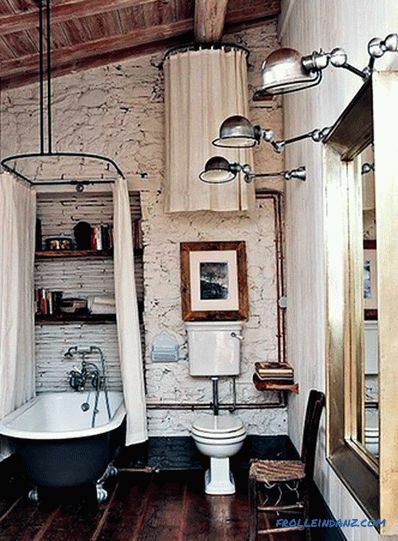 There should be a lot of light in the bathroom. Usually in this room there is a small window or none at all. 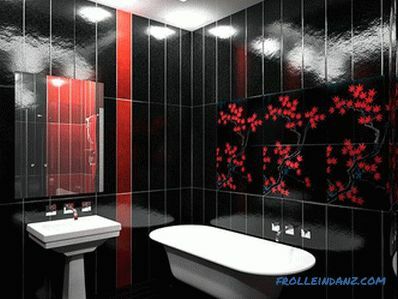 Therefore, you should correctly make the installation of lighting. At the same time the light from the lighting devices should not hit in the eye. Scattered lighting is created in a complex. 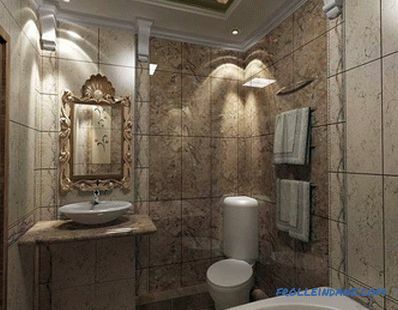 This may be LED bulbs installed around the perimeter of the ceiling, in harmony with the wall near the mirror. 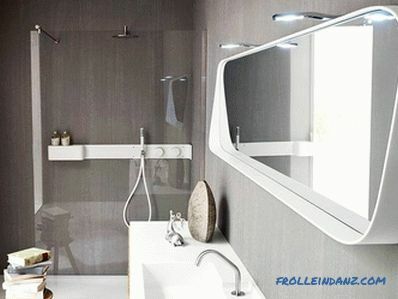 You can install one light bulb in the ceiling and one at the mirror. 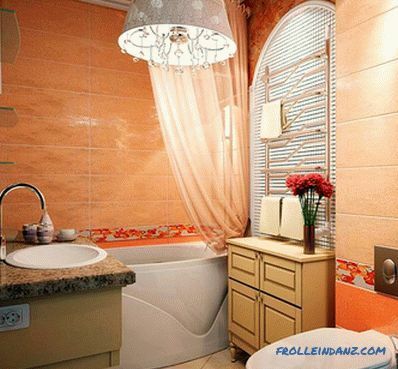 If there is no window, then it would be better to use fluorescent lamps. 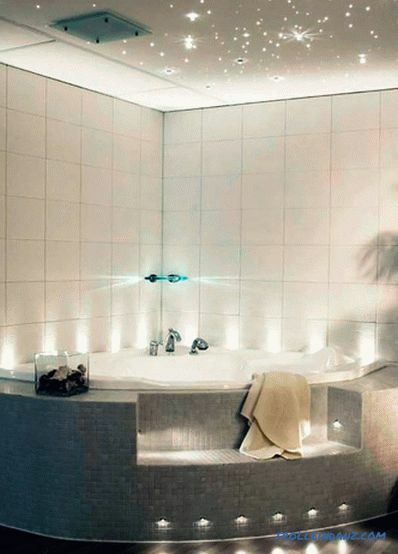 The best in the bathroom look ceiling lights. But they can be installed only in suspended ceilings. 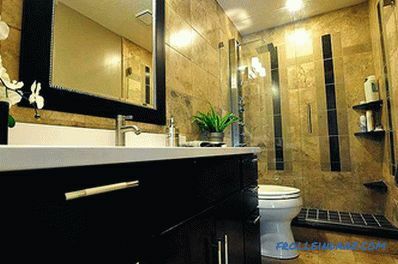 В The design process of the bathroom can not do without mirrors. 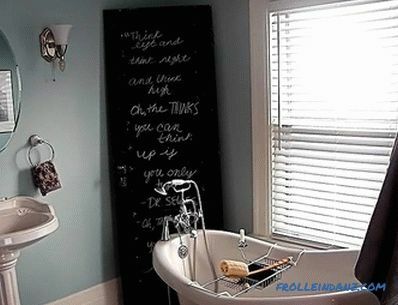 This is a great way to increase visual space. 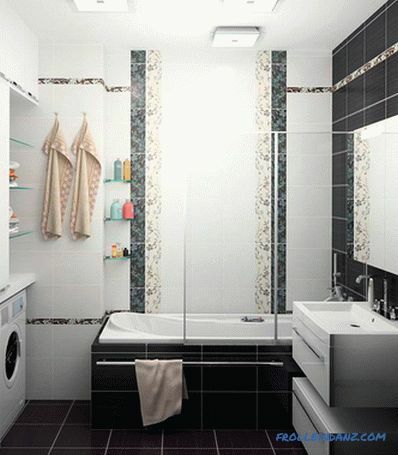 For example, it may be a cabinet above the sink with a mirrored facade. 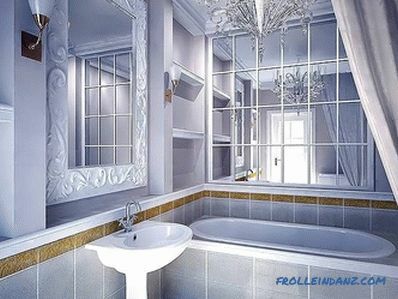 The mirror can also be installed on the door. 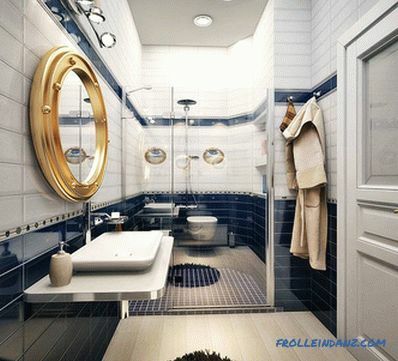 But be careful, as mirrors in large quantities will create a maze effect. 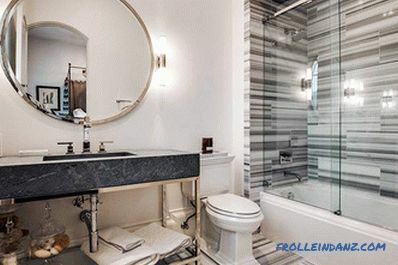 Mirrors visually increase the space only at eye level, so do not make mirrored walls. 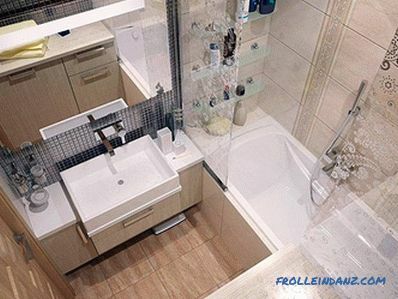 A mirror floor is also not an option, as in this case there will be a feeling that you are at the bottom of the well. 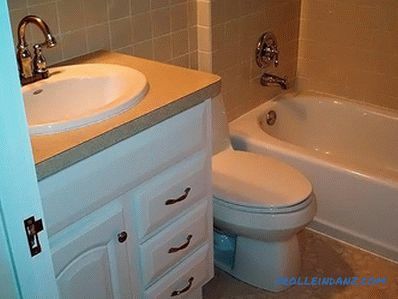 There should not be a lot of furniture in a small area. 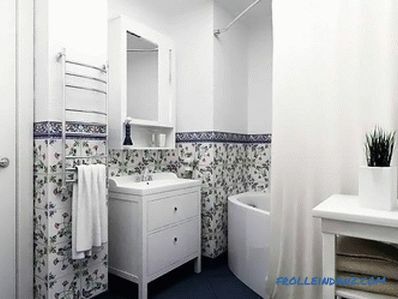 All that is needed in this room is a few shelves above the toilet and a bedside table under the sink with a mirror cabinet above it. 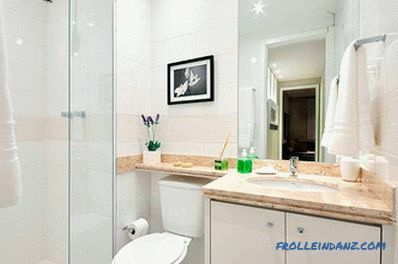 In order to have more space in the bathroom, the doors should be installed so that they open to the outside. 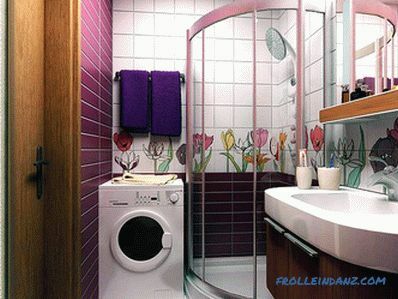 If the width of the wall allows, you can install a sliding door. 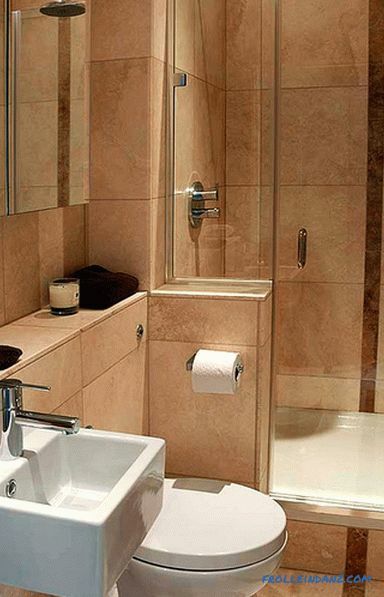 An excellent solution for increasing space visually are glass doors. 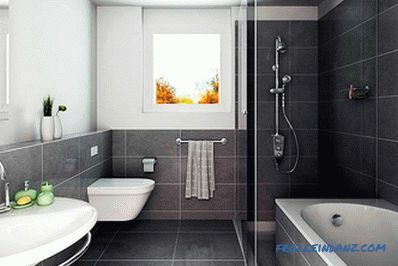 When arranging such rooms, you can include in the project a niche wall, which will divide the space of the bathroom with a toilet into two zones. 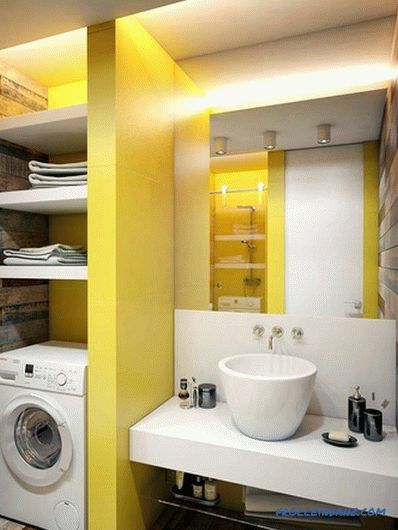 Niches can be used as a rack, placing, for example, in them clean towels and cosmetics. 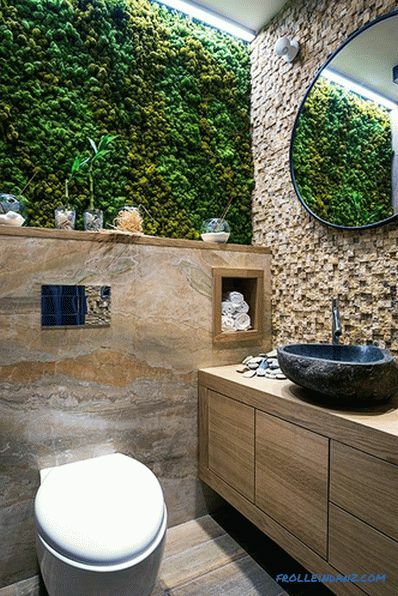 If you chose a bright interior, you can use a live plant as an accent. It is worth noting that such a solution looks very impressive. 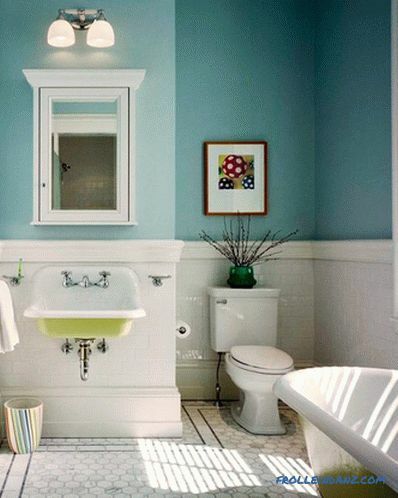 Those times in the past remained when all the bathrooms looked approximately the same, and in all parts of the country.Today, you can choose the style that is closer to you, while beating it so that your bathroom always remains unique, unlike any other. 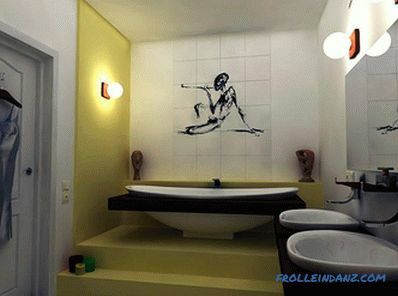 It is worth noting that the best looking apartment, made in the same style. 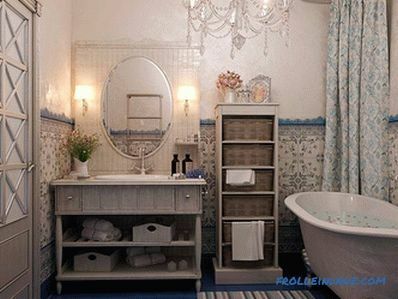 That is, if you chose a nautical style, then its elements should be traced throughout the premises. 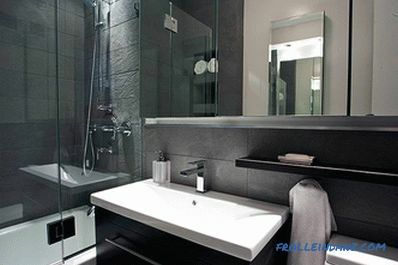 Below will be considered the features of different styles in the interior of the bathroom, as well as examples of ready-made bathrooms, made in each style. Classic, it is a classic, therefore it is always relevant. 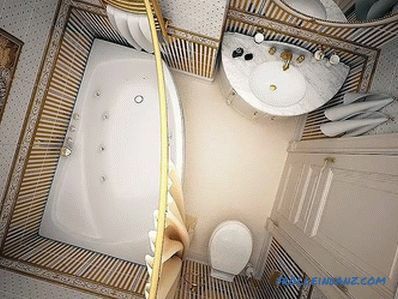 The main attribute of the bathroom, made in this style - bath. Ideally, it should be brass, marble or cast iron. A feature of the classic style are bent legs. 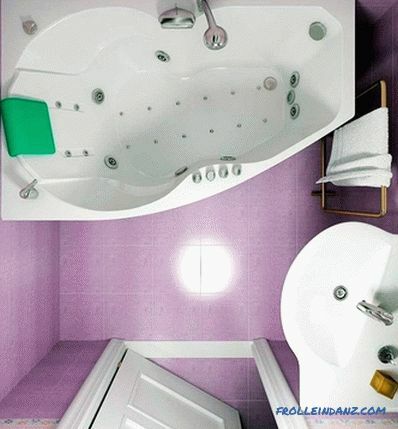 The room should be made in bright colors. 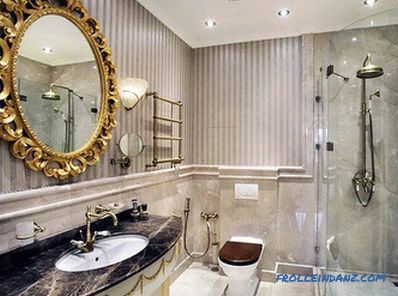 While the mirror frames, taps and mixers must be copper, bronze or gilded. 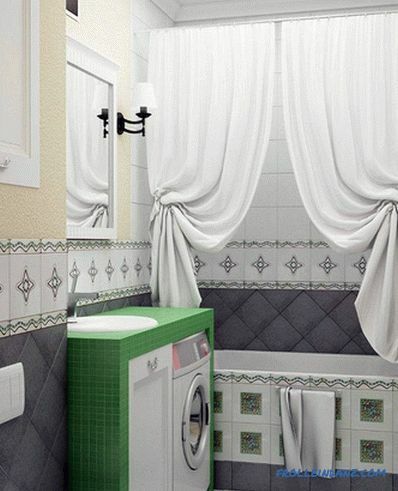 A distinctive feature of the classical style is refinement and high cost. 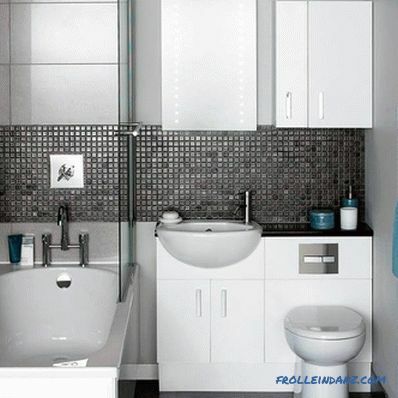 The minimalist style is characterized by a minimum of details and a maximum of space. 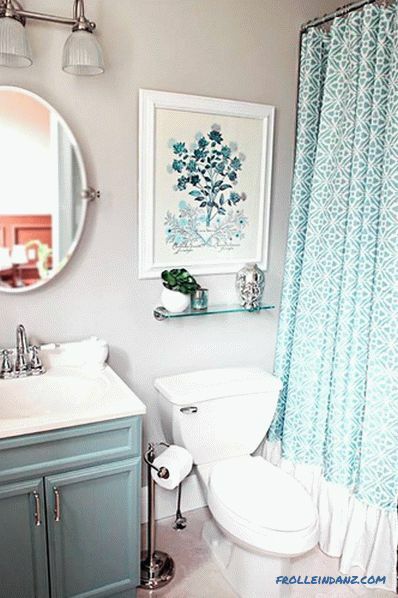 To create comfort in a small bathroom, this style fits perfectly. 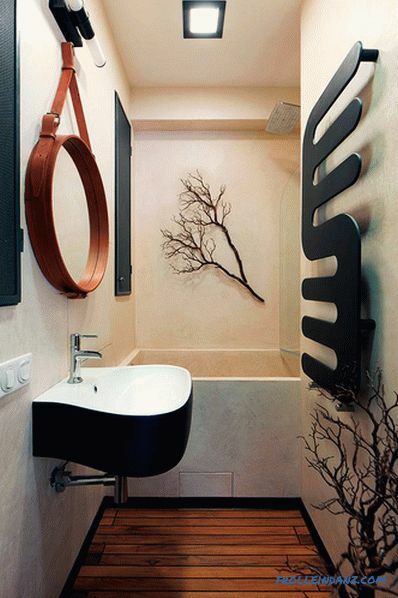 Minimalism implies the presence of objects with smooth outlines and clear corners. An abundance of different colors in this style is unacceptable. Maximum one or two colors. 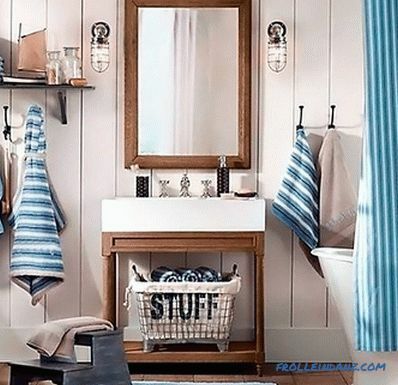 When making this style you can not be mistaken, because everything should be at a minimum, this applies not only to colors and furniture, but also accessories. 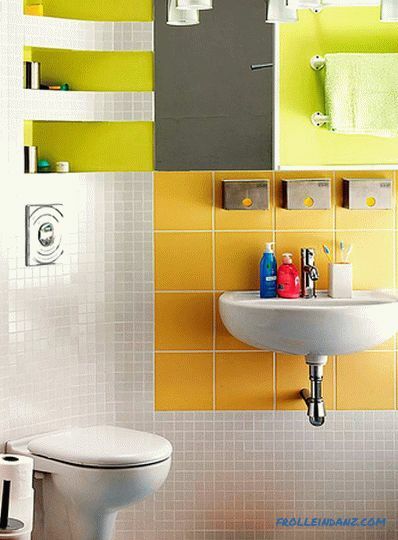 For this style characterized by the presence of bright colors. 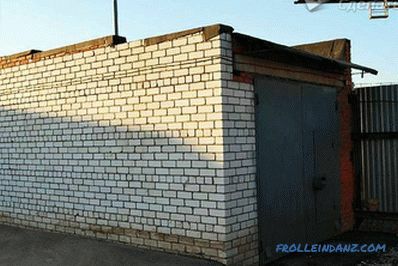 Original solutions are welcome. 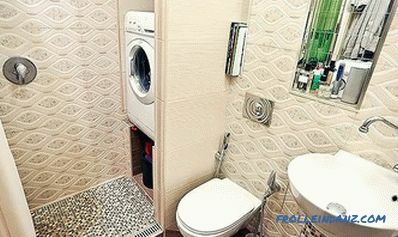 It uses small-sized, but multifunctional plumbing. 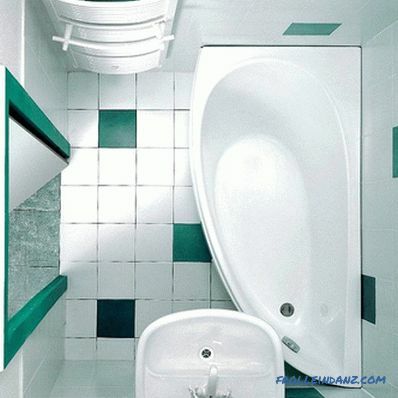 Bathroom areas should be clearly separated. 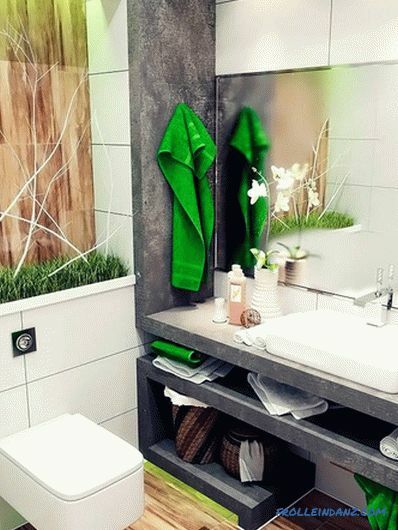 Accessories are selected non-standard in shape and color. 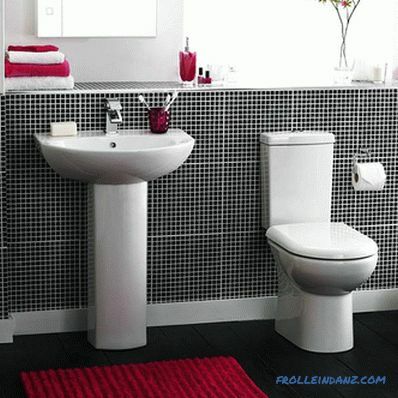 Combinations are typical of this style as well as for modern. bright colors. 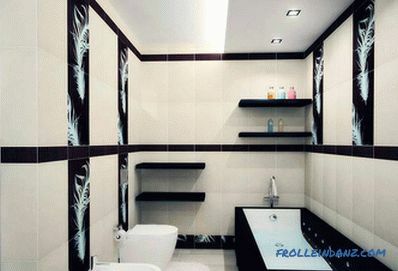 In addition, modern style combines incompatible materials. 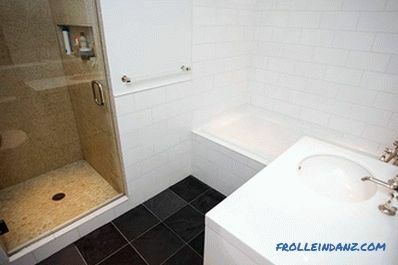 Relevant zoning of space. 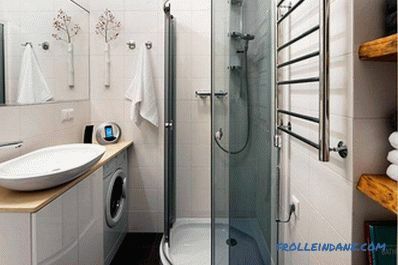 If you install a shower cabin, then the corner option is best for this, the same can be said about choosing a bath. The advantage of style - the creation of a unique design does not require large investments. Japanese ethno-style in our time is very popular. 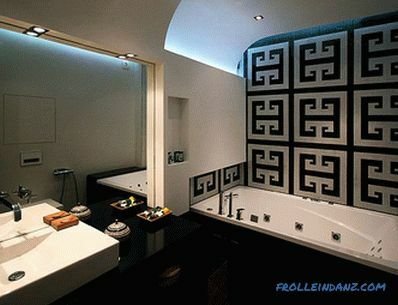 However, the design in this style would entail large cash costs. 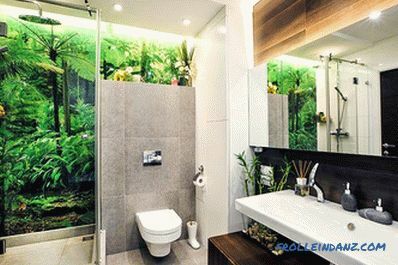 This is due to the fact that in order to decorate a bathroom in this style you will need a large amount of expensive natural materials. Among them are expensive woods, rice paper, bamboo and silk. The distinctive characteristics of the Japanese style are reasonableness, rigor and conciseness. 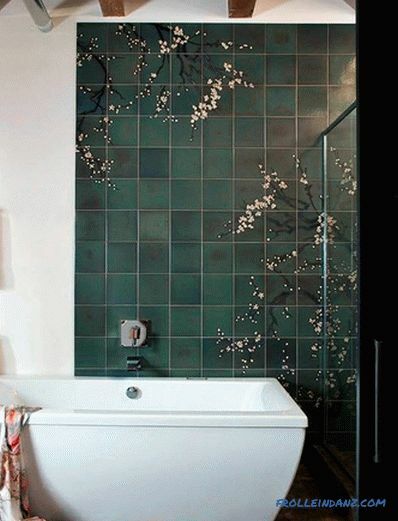 If you do not have significant funds, but you want to sustain the design in the Japanese style, then you can buy ceramic tiles with a themed ornament or pattern. It can be traditional houses, sakura branches and hieroglyphs. An integral part of the Japanese style is the matching accessories. In this case, you must purchase candles in glass candlesticks of different colors. Nostalgia. 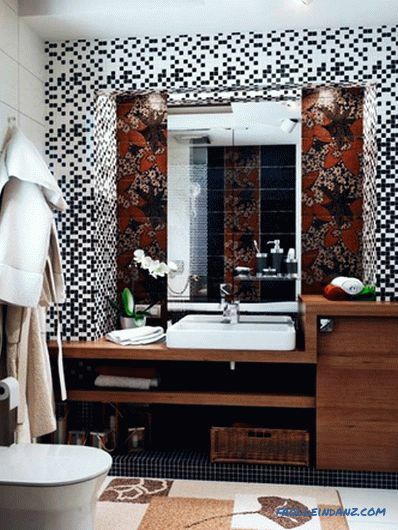 This feeling pushes people to create a retro-style in the apartment, including the bathroom. It seems that life has been easier in the past. 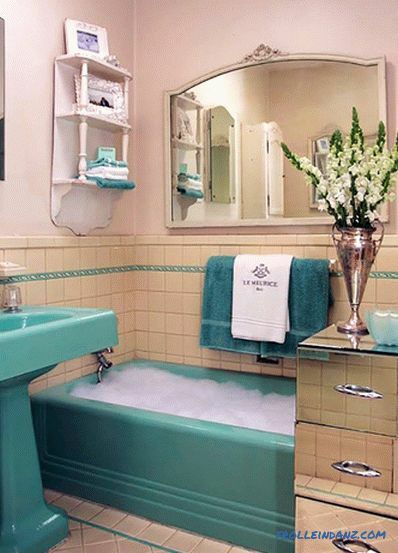 Bathroom with shades of retro style looks very original. Trump style - a minimum investment. All you need is ingenuity and manual dexterity. 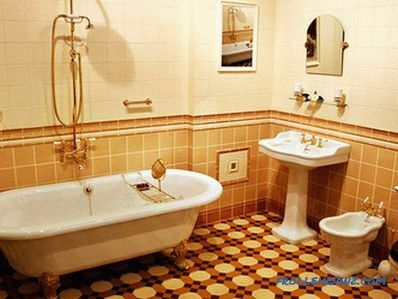 All elements that today are considered old-fashioned will be suitable for retro-style. 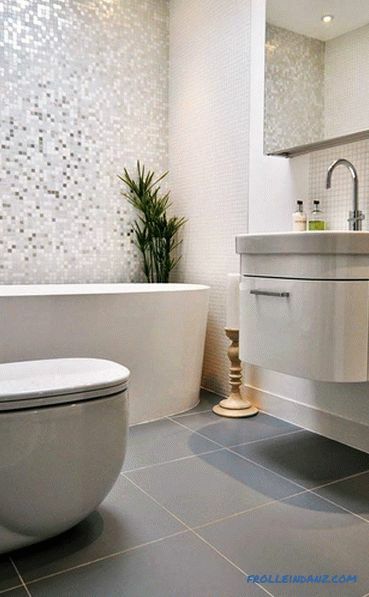 White cabinets are perfect for this design. 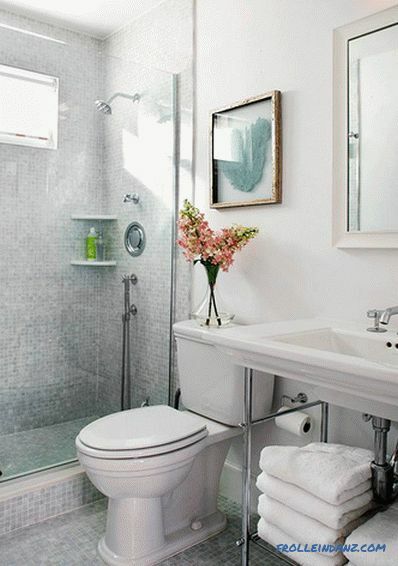 They will create a light and airy atmosphere in the room. Retro perfectly combined with almost all the accessories of modern times. Delicate textiles and wallpaper with small floral patterns and openwork embroidery - that's what you need for a retro design. 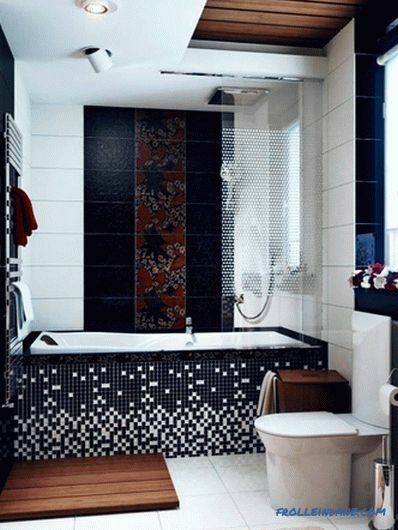 Fans of retro and bright colors will also be able to find an excellent design for themselves, since retro is characterized by bright colors, including red, blue, fuchsia, green and blue. 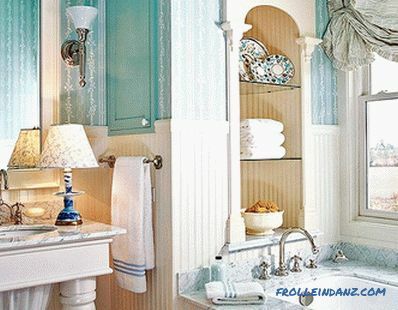 Frilly decorations are unacceptable for country style or country. 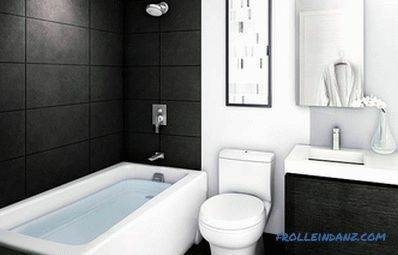 The main characteristics of this trend in design are simplicity and functionality. 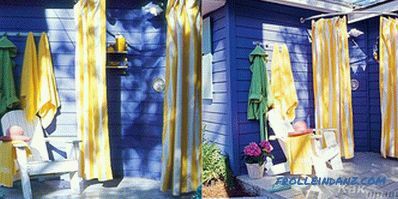 The walls are usually whitewashed, and the doors and windows are painted in rich colors. The furniture should be rough. 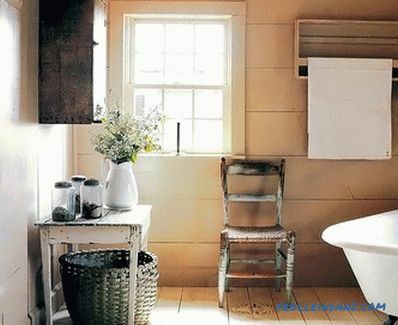 Simplicity and lightness never bother, so the rural style never becomes familiar with its owner. This is explained by the fact that in the style of country music there are no elements of fake, artificiality and bombast. 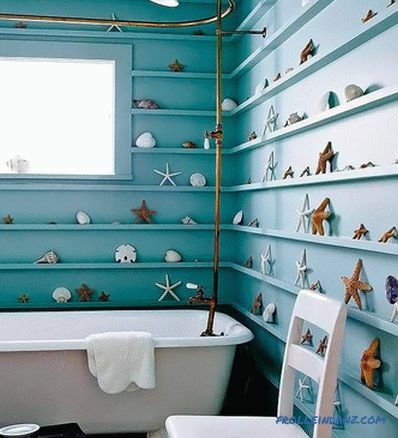 Maritime theme means a combination of white and blue. 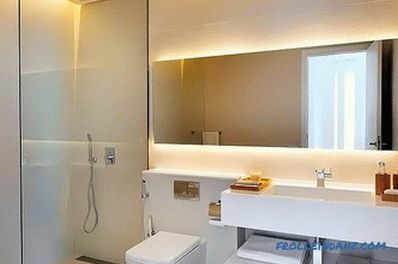 Of course, the design of the apartment and the bathroom in the sea style can not replace a full-fledged rest on the sea beach, but the mood will definitely lift, and it will help relieve the tension from everyday fuss. 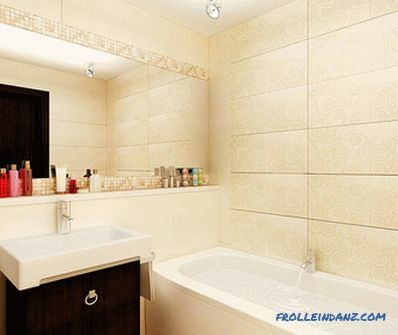 The characteristic features of the style are expressiveness, decorativeness and high cost. Furniture should be made of wood, which can be artificially aged. 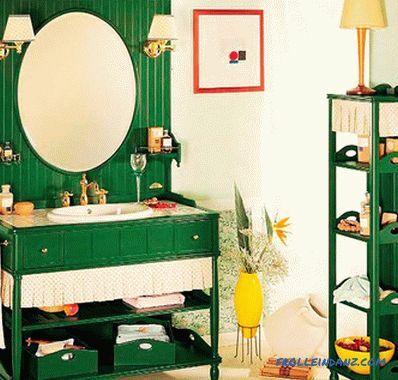 Decorative items must be made from natural materials. 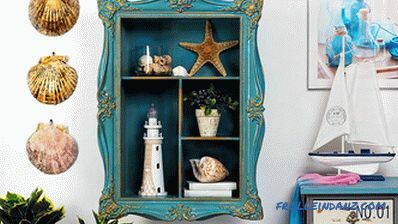 Maritime style can be supplemented with elements of country and Provence. 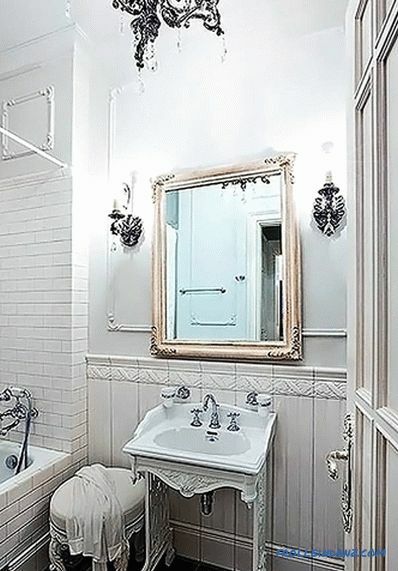 So, the interior of a small bathroom can be tasteful, neat and unique. The main thing is to make a competent plan of action and strictly adhere to it. If you still have questions on the topic, then you can write them at the end of this article, in the line - comments.